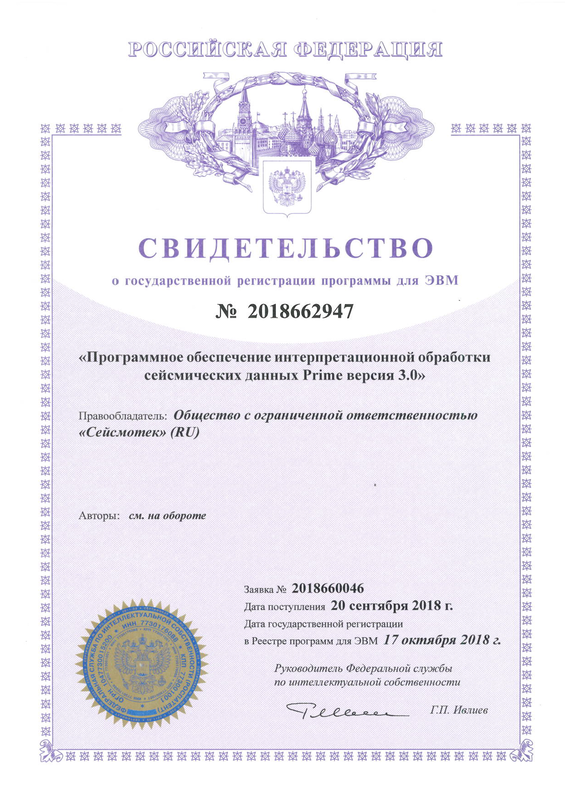 17th October, 2018, "the version 3.0 of Prime software for the interpretative seismic data processing" was registered and published on the website of Rospatent. The Prime 3.0 version has been considerably extended by adding a number of interpretation tools, which enhances collaboration of processing engineers and analysts starting from the early project stages. Options for estimation of parameters required in interpretation were added to 3D Migration, they are: signal amplitude at various angles of beam reflection from an interface; components of vector normal to an interface; information on a tangency point position on diffraction travel time graph; and model-based wavefield separation into specularly reflected and diffractive components. These options bring the system closer to interpretation and allow more accurate estimation of wavefield amplitude parameters. In addition, the 3D migration of multiples that is often used for offshore data handling was implemented. New algorithms for 3D travel time inversion were developed. Programs designed to solve a wide range of tasks for post-migration cubes processing and seismic geometry attributes calculation were added; a number of improvements in technological processes were made. seismic data processing Prime it en IT Cluster Seismotech Seismotech, Ltd.